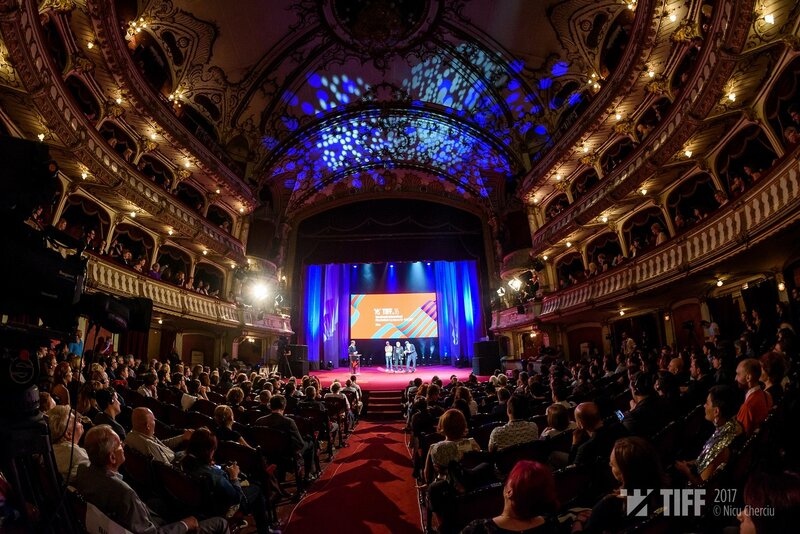 The 16th Edition of Transilvania International Film Festival (TIFF) designated its winners on Saturday night, 10 June, at the National Theatre of Cluj. Transilvania Trophy, amounting to EUR 15,000, sponsored by Staropramen, was granted to the feature film My Happy Family, the Georgianstory directed by Nana Ekvtimishvili and Simon Gross. The director of cinematography was Tudor Panduru, who attended the event. 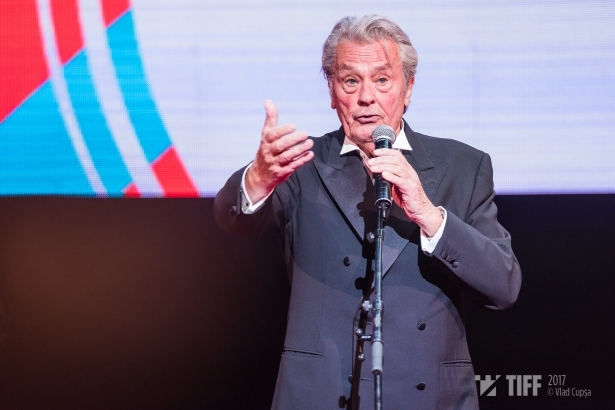 The closing gala, having as main guest actor Alain Delon, will be broadcast on Sunday, 11 June, from 21.10, on TVR 1. TIFF competition jury, made up of actress Clotilde Courau (Princess of Venice andPiedmont), producer Elizabeth Karlsen, film critic Geoff Andrew (Sight & Sound) and director Marian Crișan also granted Best Director Award, amounting to EUR 5,000, to Guðmundur Arnar Guðmundsson, for the film Heartstone. The story conquered the audience as well, being rewarded with the Audience Award. Actress Ia Shugliashvili, at her first role in a film, was distinguished with the Best Actress Award, amounting to EUR 1,500, offered Conceptual Lab, in the film that won The Transilvania Trophy, My Happy Family. 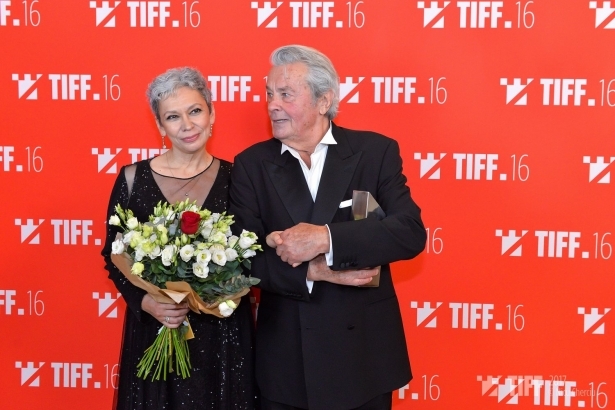 A Special Mention of the Jury was granted to the feature film Gloria/ Glory, directed bythe Bulgarian couple Kristina Grozeva and Petar Valchanov. 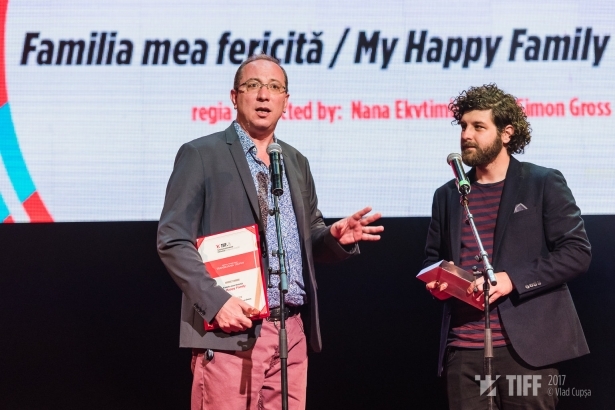 The Special Prize of the Jury, valued at EUR 1,500, sponsored by HBO, went to the film God’s Own Country, directed by Francis Lee and starring actor Alec Secăreanu. Actors Haris Fragoulis and Iro Bezou, the protagonists from Afterlove, went up the stage of the National Theatre, where the Jury of the National Film Critics Federation handed them the FIPRESCI Award. Not less than 800 guests, viewers and journalists watched the ceremony presented by the Festival's Chairman, Tudor Giurgiu, and several tens of thousands of people admired the stars making their appearance on the red carpet, through the live broadcasts on Facebook and YouTube, among them being Alain Delon, Ulrich Seid, Radu Mihăileanu, Nae Caranfil, S.S. Rajamouli, Gheorghe Visu, Ion Dichiseanu, Andi Vasluianu, Olimpia Melinte, Crina Semciuc, Maria Obretin and TV hosts Amalia Enache and Cătălin Ștefănescu. 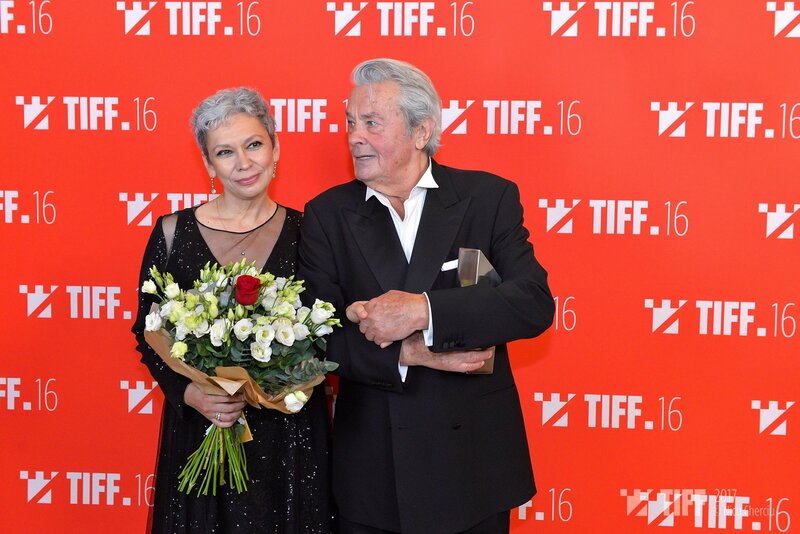 The Lifetime Achievement Award for his Entire Career was handed out to the legendary French actor Alain Delon by Oana Pellea. The actor stated that he was very touched by the enthusiastic reception he hot in Cluj, and declared on stage that he was lucky enough to have „the most beautiful job in the world”. 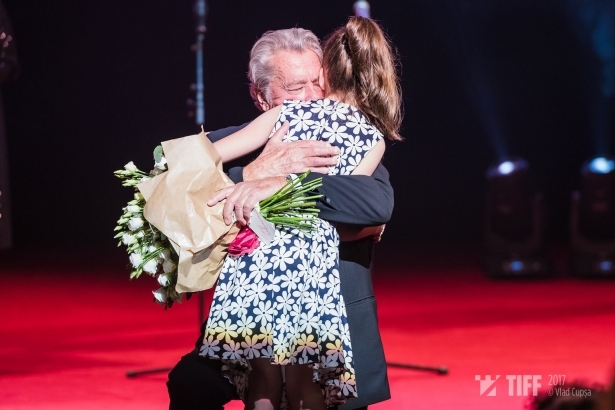 Attending the festival for the first time, Violeta Andrei was granted the Lifetime Achievement Award and promised on the stage of the National Theatre that she would publish her memories and dedicate the book to the audience that adored her. Tora Vasilescu was glamorous on stage and was granted the Excellency Award. Tudor Giurgiu announced also a symbolic prize for Adela Stan, the teacher with the „Mihai Viteazu” National College of Turda, who had been recently reprimanded after recommending the pupils to watch the film Total Eclipse (directed by Agnieszka Holland). He promised her that she would be a special guest to the next edition in order to be honoured for the courage with which she had faced this injustice. 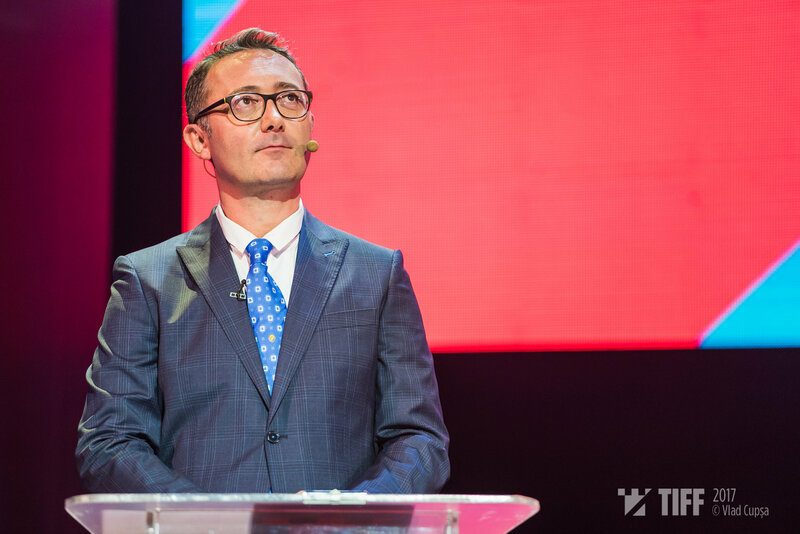 TIFF artistic director, Mihai Chirilov, said he was enchanted by the diversity characterising this edition. ”TFF is wearing a large had and everybody fits beneath it. And I think the biggest mistake we could make is to grant privileges to higher culture in the detriment of the pop culture”.The Romanian Film Days Award for the Feature Film section, amounting to EUR 6,000 (de post-production service), sponsored by Cinelabs România, was granted to the film Inimi cicatrizate/ Scarred Hearts, directed by Radu Jude. Granted theRomanian Film Days Award for Debut, amounting to EUR 1,000, sponsored by Raiffeisen Bank, Cosmin Bumbuțand Elena Stancu confessed that they never expected to win an award when they were making Ultimul căldărar / The Last Cauldron Maker. The Romanian Film Days Award for the Short section, amounting to EUR 1,500, sponsored by Jameson, and camera& electrical& grip equipment services, offered by R3 Film Rental, went to Scris/Nescris / Written/Unwritten, by Adrian Silișteanu. In his speech during the gala, the director addressed the Minister of Culture, Ionuț Vulpescu, asking him to get involved in the process of improving the Cinematography Law. Attending the event as member of the jury, Corina Șuteu reminded the said dignitary,,from a former Minister to a current Minister’’ of the 450 signatures gathered for the return in the Parliament of the Government Emergency Ordinance 91/2016 on cinematography. Together with Jonathan Horizons IFF of Wroclaw), Corina Șuteu was part of the Romanian Film Days jury that also granted a Special Mention to the short Offstage, directed by Andrei Huțuleac. The Best Short Award of the sectionShadows, amounting to EUR 500, sponsored by Shorts TV, was granted to the film Curve, directed by Tim Egan, and two Special Mentions in the section Shadows-Shortwent to the films I Am The Doorway, directed by Robin Kasparik, and Behind, by Ángel Gómez Hernández. Handed out for the first time at TIFF, the Cinepub Audience Award, for the most popular film in the Romanian Film Days section, valued at EUR 1,500, went to Planeta Petrila / Petrila Planet, by Andrei Dăscălescu. He went up on stage together with Cătălin Cenușă, a miner from Valea Jiului, and dedicated the film to those who stay strong in face of injustice and to the miners from the area he documented. 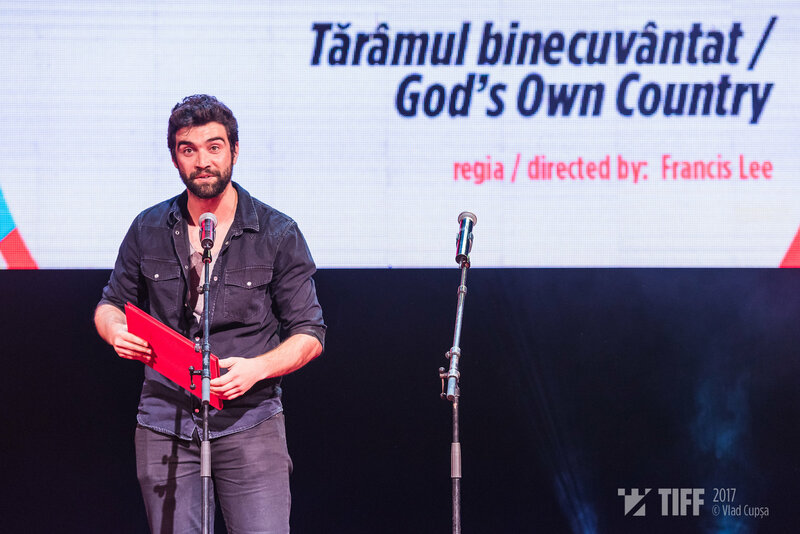 Within Transilvania Pitch Stop Workshop, theCoCo Award went to Dumitru Grosei, for The Island. The winning project will be invited to deliver a pitch in front of the industry professionals present at Connecting Cottbus (Germany). Villa kult Cultural Residency Award – a 5-day residence in Berlin for script development purposes, went to La Civil, by Teodora Ana Mihai. 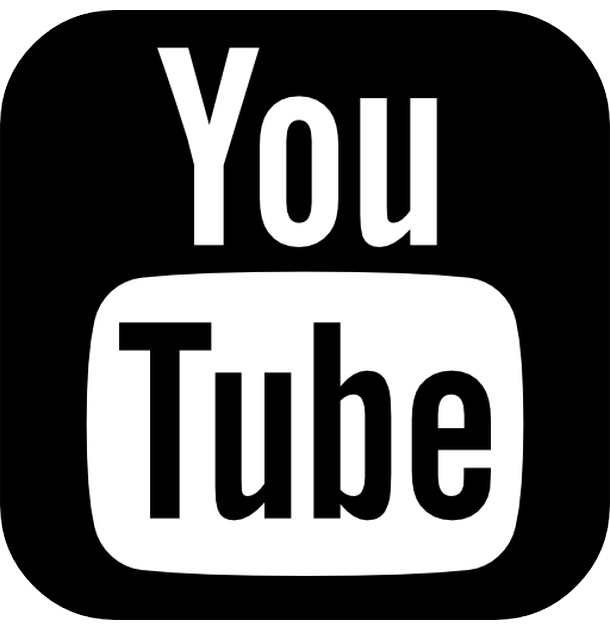 Let’s Go Digital! Award, for the Best Film made within the film workshop for teenagers, sponsored by UPC, was granted to Și planetele filozofează / The Planets Also Philosophise, by Patricia Suciu, Ștefan Iordache and Sara Pongeac. The Award of the Young Francophones Jurywas granted by TV5 Monde, RFI România and the French Institute to the feature film L'Effet aquatique / The Together Project, directed by Sólveig Anspach, which surprised everybody through its original script.